Accuweigh’s Onboard Weighing System was recently installed on a UD tipper for a City Council located in Central Queensland. Onboard Weighing Systems can eliminate accidental vehicle overloading which could incur fines and/or prosecution under the Chain of Responsibility Legislation (CoR). 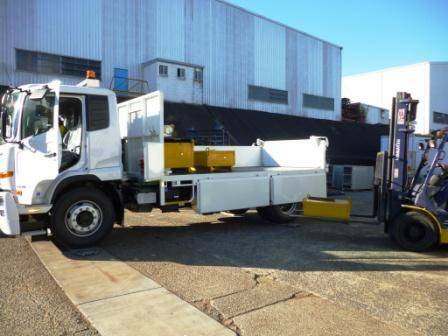 Accuweigh’s Brisbane branch supplied and fitted a TruckWeigh Onboard Weighing System to the vehicle’s spring suspension components before the body was fitted to the light tipper truck. Accuweigh’s highly trained and experienced service crew then tested and calibrated the system using test weights to ensure repetitive and accurate weighing results were being achieved. Accuweigh’s TruckWeigh Onboard Weighing System can be fitted to either spring or air bag suspension vehicles (or any mixed combination of the two) due to its industry leading “dual sensor” capability. Another bonus feature allows trailers and prime movers to be readily interchanged without requiring re-calibration of the system. All calibration data is stored digitally onboard each vehicle’s component and the digital weight indicator automatically uploads the required calibration data from the mating truck/trailer component(s) and then collates the weight readings of all axle weights. Accuweigh is Australia’s largest industrial weighing company and is the exclusive Australian distributor for the PM range of Onboard Weighing Systems manufactured in the UK. Accuweigh has branches in all mainland states providing Superior Product Support on all onboard scales and weighing systems.